What are the benefits of crossbreeding with HYVIG? Norwegian Red (NR) cows have been on trial at the Moorepark ‘Ballydague’ research farm since 2001. Interest in the breed stems from the fact that since the 1970s female fertility, resistance to mastitis, and other functional traits have been included in the breeding program of the breed. Since 2001, the cows at Ballydague have performed well. 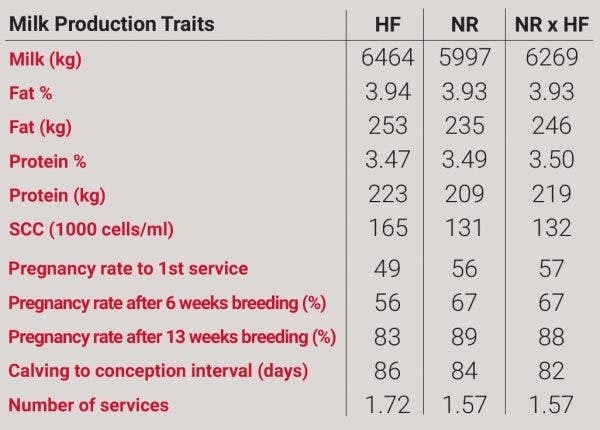 The reputed characteristics of the breed; ease of calving, high female fertility and low SCC/mastitis incidence have been observed with the small numbers on trial. Therefore, in 2004 a large scale study was set up by Moorepark involving the importation of almost 400 purebred NR heifer calves. These animals were spread across 50 dairy farms and along with a similar number of crossbreds (NR×HF) and Holstein-Friesians (HF), now form part of one of the most unique research studies in the world; a very comprehensive study aimed at conclusively evaluating the merits of the NR breed and the potential benefits of crossbreeding under Irish conditions. Currently the study includes just over 1300 cows across 46 herds. The Norwegian and crossbred cows are by 10 proven bulls. The HF group represent a mix of HF genetics from around the world, having been sired by a broad spectrum of North American Holstein, New Zealand and British Friesian type sires. All cows on the trial were born in 2004 and calved for the first time in the spring of 2006. Norwegian Red cows produced milk with a higher protein content than Holstein-Friesian cows, while milk fat content did not differ between breeds. Holstein-Friesian cows tended to have higher 305-day milk yields than Norwegian Red cows during lactations 1–3 (mean: 6476 vs 6219 litres), but not during lactations 4 and 5 (mean: 7206 vs 7178 litres). Fat plus protein yield was unaffected by breed. As the condition score results from this study suggest energy balance was similar with both breeds, the improved fertility observed is likely a direct reflection of the long term genetic selection for fertility traits within the Norwegian Red breed. Norwegian Red cows had improved longevity, with 27.2% of Norwegian Red cows and 16.3% of Holstein-Friesian cows surviving until the end of the fifth lactation. When extrapolated to give life-time survival, on average Holstein-Friesian cows completed 3.5 lactations while Norwegian Red cows completed 4.2 lactations. The results proved that Norwegian Red provide another solution to crossbreeding in grazing systems. Based on this further trials were done looking at the performance of Norwegian Red x Holstein Friesian with Irish Holstein. Again the results indicated improved fertility with the same amount of production. Further research has been done looking at the Norwegian Red as a third cross in a traditional Jersey x HF programme. Many producers are looking to improve hybrid vigour and indeed solids after a few generations of 2 way crossing.